A new look for absinthe. J. Absinthia Vermut first tasted neon green absinthe in 1996. A year later, she was already making her own. “It fascinated me. I wanted to know why it was illegal for so many decades, why it was so loved and then so hated,” the Oakland resident said. For years, Vermut worked on her absinthe and became known for serving the anise-steeped spirit at Burning Man parties. Someone gave her the nickname "Absinthia," and she identified with it so much, she made it her legal name. In 2007, the absinthe ban was finally lifted, and Vermut set her sights on launching her own small-batch absinthe brand using organic, West Coast ingredients. Now, it’s ready: Absinthia’s Bottled Spirits. Absinthia is currently just selling blanche (white in French) absinthe, although a verte (green) version is in the works. Vermut recommends mixing roughly two-and-a-half parts water into one part absinthe, until the color turns milky. Compared to other absinthes I’ve tried, Absinthia’s Absinthe Superieure Blanche is lighter, cleaner, and exceedingly smooth. The other artisanal absinthe player in the region is Alameda's St. George Spirits, which makes an also delicious but very different version that’s more floral and intense. Absinthia’s recipe follows a traditional Swiss style, and it's even made in copper pot stills. Given the spirit’s relatively recent legalization, plenty of people have still never tasted absinthe. Vermut, who is also behind the popular Caged Heat cocktail syrup, is ready to educate. She hopes people won’t cling to their initial reaction, which is often that absinthe’s anise makes it taste like black liquorice. Certainly, it's an herbaceous drink, full of fennel, coriander, lemon balm, and, yes, wormwood. 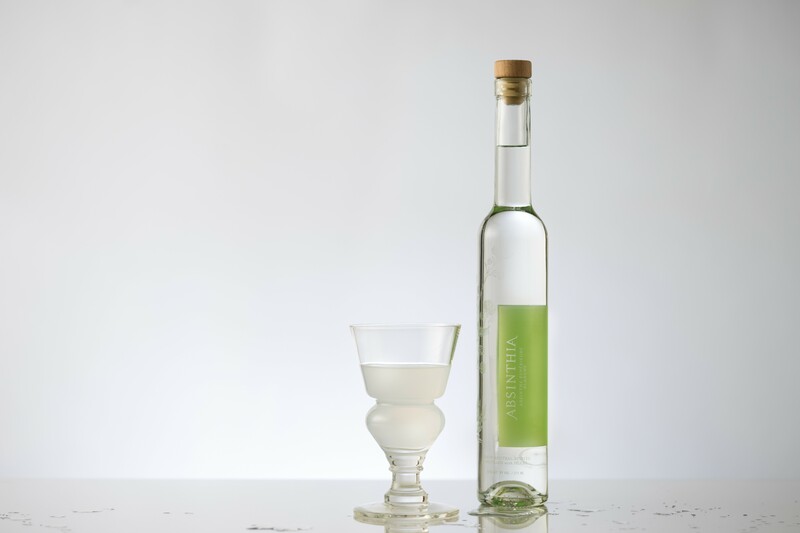 Absinthia's Blanche is available in 375ml bottles for $35 — Vermut decided to go for smaller bottles and a lower price point than the norm in an effort to convert new drinkers. Similarly, she moved away from absinthe’s more typical imagery of evil, death, and darkness. Instead, her bottles sport a minimalist look. In the East Bay, find Absinthia at Alchemy Bottle Shop (3256 Grand Ave., Oakland), Crown Liquors (6125 Medau Pl., Oakland), Eddie’s Drive In Liquors (5491 College Ave., Oakland), Ledger’s Liquors (1399 University Ave., Berkeley), Savemore Market (4219 Park Blvd., Oakland), and Sidebar (542 Grand Ave., Oakland). Absinthia.com.